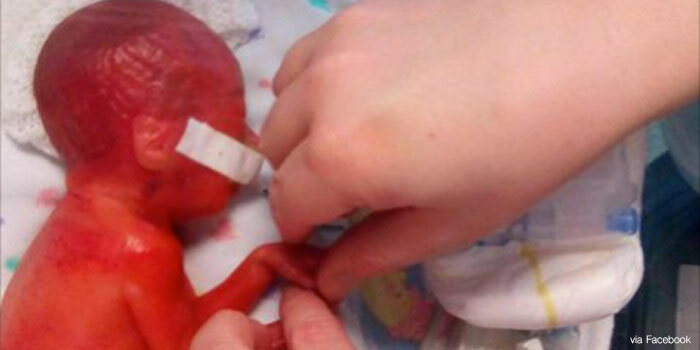 When premature baby Hailie Dillon was born, her mother said she looked like a red alien. Cheri Price lost her mucus plug and began having contractions at just 20 weeks pregnant, terrifying the family. Price went to the hospital at their home on the Isle of Wight, but originally, doctors refused to help the family, calling it a “late miscarriage.” But miraculously, Hailie survived, and is now a healthy, thriving one-year-old. After going into labor, Price traveled with her boyfriend, Hailie’s father, Tim Dillon, over 250 miles to Darlington to seek better options for health care, as well as to be closer to family, who would help care for the couple’s other child. Through the entire eight-hour journey, Price had contractions. “We just thought we would take the chance at a larger hospital – and we were closer to relatives so they could help with childcare for Jack. I was discharged – but then my waters broke while I was watching Hollyoaks two days later,” Price recalled. And just two days later, Hailie was born on February 23, 2017. Price was at just 23 weeks and six days gestation — one day short of Britain’s abortion limit of 24 weeks. At first, things looked rough for little Hailie. After she was born, she did not breathe for seven minutes, and she had to be resuscitated. “She was still in the fetus stage and she didn’t look like a baby at all – we couldn’t believe she even survived,” Price said. “From birth, she was put in an incubator and we couldn’t touch her – but we could see all the veins of her brain through her red skin.” Hailie weighed just one pound. She also suffered a collapsed lung. Price couldn’t hold Hailie for 18 days, and the family could not leave the hospital for three months, waiting to see if Hailie would survive. But even then, Hailie still appeared to face challenges. She didn’t open her eyes, as they had been fused together, and her retinas were not developing correctly. Doctors feared she would be blind, and diagnosed her with Stage Three ROP (retinopathy of prematurity). But after visiting multiple specialists, Hailie’s sight was saved. She was finally allowed to go home on June 19th, months after her birth. The Royal College of Obstetricians and Gynaecologists has declared 24 weeks as the point of viability, and that treating a premature baby before this point poses a “major medical and ethical challenge.” It’s only after 25 weeks that there is a “general agreement that active management should be offered.” However, new research has found that up to 71 percent of premature babies, including micro-preemies born at 22 or 23 weeks, can survive if given active care. It’s clear that medical advancements have pushed the point of viability earlier and earlier in pregnancy, with babies like Frieda Mangold surviving after being born at just 21 weeks. The survival of these babies only further proves the humanity of preborn children; after all, nothing changes between pregnancy and birth except location. Every premature baby like Hailie is a living human being who deserves to be protected, not condemned to death through abortion, and each also deserves the best medical care available. It’s increasingly obvious that 24 weeks as the magical point of viability is meaningless. All babies deserve life.